An Indian peasant rises to become the close confidant and teacher of Queen Victoria of England, much to the chagrin of her aristocratic house. Hey, whaddya know, a Victorian-era period piece that's actually about Queen Victoria! 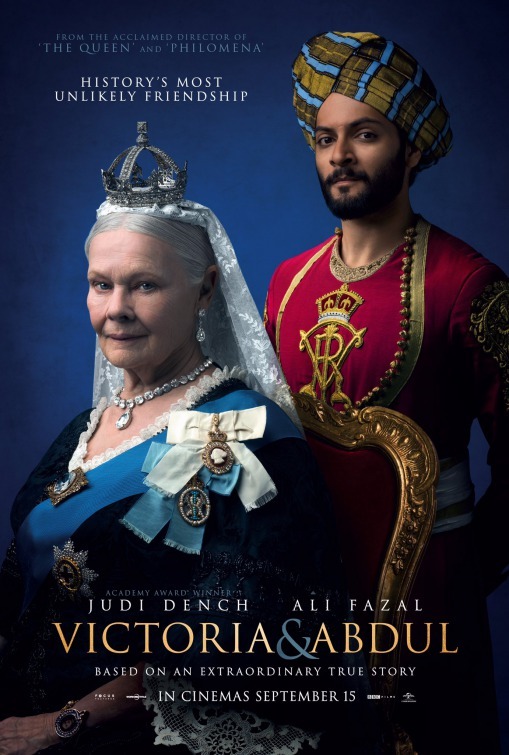 "Victoria & Abdul" is a mostly true biographical dramedy about Queen Victoria and her special relationship with an Indian Muslim peasant named Adul Karim. The film stars Judi Dench and Ali Fazal as the titular Victoria and Abdul. This is a story about a friendly relationship between two of the most unlikely companions who saw eye to eye despite any other outside reasonings. It's hard to imagine how a lowly clerk at a prison came to be a teacher to Queen Victoria herself, but astonishingly enough, he did, regardless of what the nobility of England want you to think. It also deals with the class system in England and the desire of aristocratic families to keep perceived "others" out of their inner circle. The film is directed by Stephen Frears, who is known for directing such movies as "Philomena," "The Queen," and "Dangerous Liaisons," so it's safe to say he has some experience with period piece films. Despite its derivative nature thematically, "Victoria and Abdul" is a very well acted film. Judi Dench is utterly fantastic as Queen Victoria, a role she has played in the past. Dench is wonderful at displaying a wide range of emotion and really brings out all the characteristics of a multi-dimensional character, from a cantankerous elderly woman to an aristocratic figurehead who has watched all of the people she cares about pass away before her. Ali Fazal also does a great job in his performance as Abdul Karim. Unfortunately, his character is a bit too bland and one-note. He doesn't have enough depth, which limits what Fazal is able to display in this role. As far as the rest of the cast, including the likes of Eddie Izzard, Michael Gambon, Olivia Williams, or Tom Pigott-Smith, their characters are totally one dimensional. All of these individuals are reduced to the standard stuffy, indignant aristocrat role. Adeel Akhtar also gets to deliver the occasional dry crack, mostly about his displeasure with living in England. Though the acting is good, as we mentioned, many of the characters aren't refined past the expected archetypes, which sort of makes for a safe but agreeable movie. There is a lot of light humor on display here, mostly from various situational moments and the awkward interactions between Fazal and the posh Brits who have gotten used to waiting on Queen Victoria hand and foot. As for the movie overall, despite these occasional laughs, we never really found ourselves pulled into the story emotionally like we had hoped. Despite its interesting tale, the subject matter is not as fully explored as we expected. It's a cute odd couple type of friendship flick, which we've seen multiple times this year alone. In the end, "Victoria and Abdul" is an average, slightly meandering period piece with excellent chemistry between its main characters. It's certainly watchable, but not particularly memorable.